As I sit here writing this post, it’s a Monday and I’m staring at a blank screen. In a way, I’m also staring at a blank week. Sure, I have appointments and projects and workouts and business and bills and housework and Mom stuff … but most of it hasn’t happened yet. And it’s up to me to place each task in its proper place. There is sooo much that can be crammed into either of these spaces, the blank screen and the blank week. Where to begin? How detailed to get? What floats to the top of the list and what settles to the bottom? 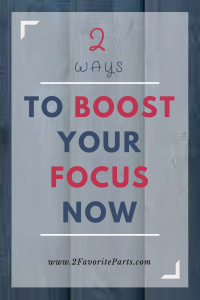 It can be incredibly difficult to focus, can’t it? Which is to say, it can be really hard to prioritize. I mean, I need to be a Mom and make lunch and do the grocery shopping and help with homework and drive to swim lessons and try to remember whether Batman or Spiderman are the greatest superhero this week. But I also need to write this blog. And meet deadline on other stories. And source for product for my Amazon business. And find another house to flip. And RSVP to that wedding invitation. And train for a 10k. And train the puppy so she can pass obedience class. And hammer out an agreement with my (insert choice words here) ex so my divorce can get finalized. And figure out how to be self-insured before that happens. And sanity. Sanity would also be a good goal, right? Speaking of which, that would be an insane to-do list, wouldn’t it? But isn’t that the kind of list we often create? A stream-of-consciousness mashup of every conceivable thing that needs to be done. And EVERYTHING IS IMPORTANT. Or so we think. And then the list overwhelms. And we are exhausted and feel like none of it got done. I’ve tried a lot of different ways to focus and organize over the years. And in all honesty, I still struggle with it. A lot. 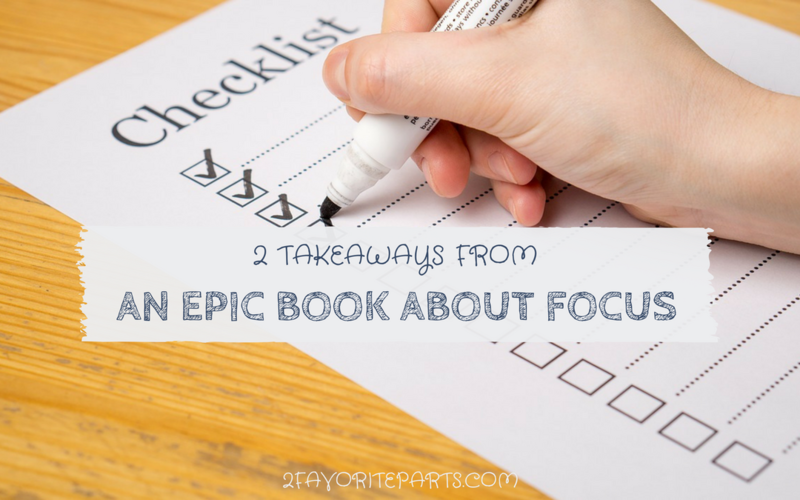 But one book in particular helped me hone my focus in a way that others hadn’t. The One Thing by Gary Keller really helped me cut through a lot of the noise in my head. Keller forces the reader to focus on — you guessed it — the one thing that’s most important, and to work like hell to get it done. If you’re looking for concise, doable ways to focus and create more effective to-do lists, read this book. Keller writes that we have 4,000 thoughts per day, or a change in thought every 14 seconds. Often, we fool ourselves into thinking we are multitasking and being productive. But multitasking is NOT effective, because our brains simply aren’t wired to effectively do two (or more) things at once. So Keller presents us with a question to help us focus. It’s the core idea that runs throughout the book. Simple question. Not so simple answer. And the results can be brilliant. I’ve gotten into the habit of using this question to plan my days and my weeks. It’s incredible how that one question can force me to focus. And here’s the thing: I feel like I accomplished a lot more. This is because my to-do list gets shortened … or at least, the list of “must-haves” gets shortened. I still tend to write too many tasks on the list — but because of the Focusing Question, I know in a heartbeat at the end of the day whether I finished what I really needed to. Think about that. Entrepreneurs, especially, like to tell ourselves that anything is doable. We love the big picture, the dream, the challenge. And for the most part, it’s true: we can do anything we set our minds to. But the practicality of it is that we then have the day-to-day drudgery to manage. The details behind the dreams. The small, consistent steps we need to take. Where to begin? With the Focusing Question. I’ll give you an example. Everything I mentioned earlier about my list is true, and more. I could write a to-do list the length of a legal pad and still not cover everything. At this point in my life, the answer is about money. With a divorce pending and a young son, I need to be self-sufficient. With that in mind, I applied for a bunch of writing jobs before doing anything else today. My ONE THING is to line up work. I need a pipeline. Then I worked on upcoming assignments, my website (part of the pipeline) and will soon work on my next Amazon shipment. See how the question can really create that laser focus we seek? I’ll still bring my son to his swimming lessons and get the grocery shopping done and RSVP to that wedding invite. But those will happen later, after I address the items that will contribute to my ONE THING. This of course ties in to the Focusing Question. 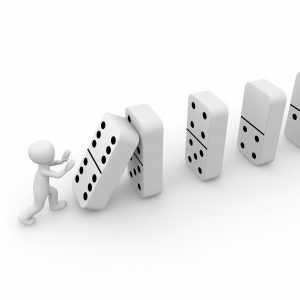 Keller gives a great analogy early in the book about the domino effect. He describes how you can line up one small domino and it can topple another one that is 50 percent larger. Keep lining them up this way, and by the 57th one you can topple a ginormous domino that would nearly reach the moon — after having started with a 2-inch piece. “Success is built sequentially. It’s one thing at a time,” he writes. You line up your priorities each day and knock them over. As entrepreneurs, we tend to focus on that highest success possible. We plaster our office walls with pictures and motivational sayings. We make sure to write our goals down because putting them in writing exponentially increases the likelihood of them happening. The trouble is, we often forget to take the 5-year plan and back it waaay the hell up … to the next 5 minutes. A lot of us are pretty great at envisioning the end, aren’t we? We’re awesome dreamers. But in 7 Habits, the point is to take that end goal/dream and figure out the steps you need to take to get there. Work backwards from the end. In other words, go small! This has been my biggest personal lesson the past couple of years. I’ve always had a penchant for big ideas and goals, and then I either became overwhelmed at how far it seemed or overestimated what I could get done in a short period of time. I’m finally learning how to take smaller steps and find pleasure in meeting those little goals along the way. I’m becoming more consistent (though the struggle is ongoing). Instead of setting a huge goal and then getting frustrated at not hitting it, I’m figuring out how to meet milestones. That might sound simple. But it’s not. 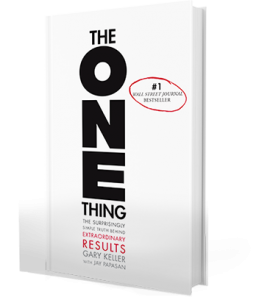 If you’re interested in learning more about The One Thing, check out the book on Amazon or visit their website at www.the1thing.com. Then let me know what you think! 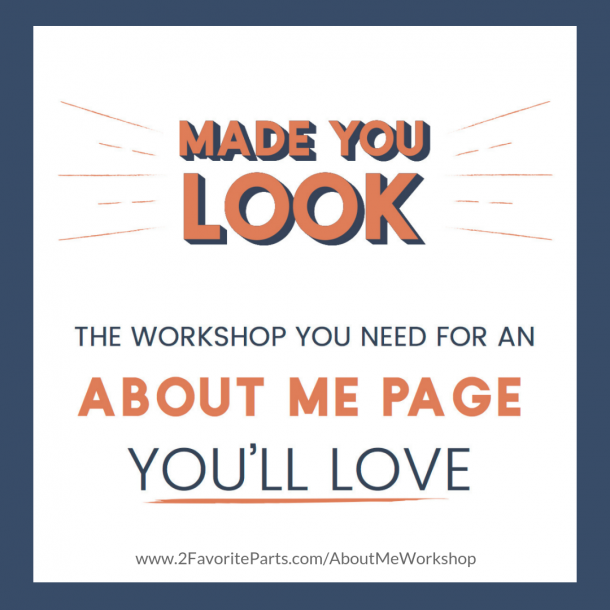 For a moment, I thought you’re talking to me – busy mom trying to do everything and being overly aggressive with our entrepreneurial plans. I like how you relate focus and mompreneur. =) It really hits hard how we struggle on a daily basis. This book made a huge impact on my business too. I’ve always had my own version of believing that “one thing” is really important, but reading the book really solidified it for me. I like your break down and talking about the small steps. This is something I try to do with projects. I have my big list of small tasks so that I can keep feeling accomplished as I move through the list. Then in the end…Bam! The big one is done. Thanks, Adrian! Moms certainly don’t corner the market on feeling overwhelmed. lol I think entrepreneurs of all kinds can relate.